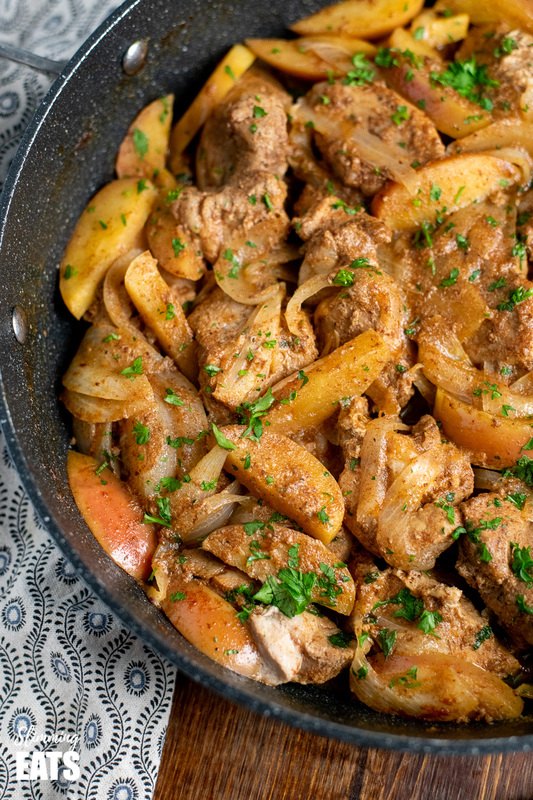 Stove Top Pork with Apples – this delicious flavoursome dish of tender pork with sweet apples, is all cooked on the stove top for a perfect meal for the whole family. With some pork shoulder in the fridge waiting to be used, I needed some inspiration. Usually, with pork shoulder, I tend to make my amazing Stove Top Pulled Pork a dish the kids absolutely love served with some Perfect Syn Free Chips and Vegetables or Salad. But this week I felt like making something a little different and was influenced entirely by the very ripe apples I had sitting on the kitchen counter that really needed to be used up. 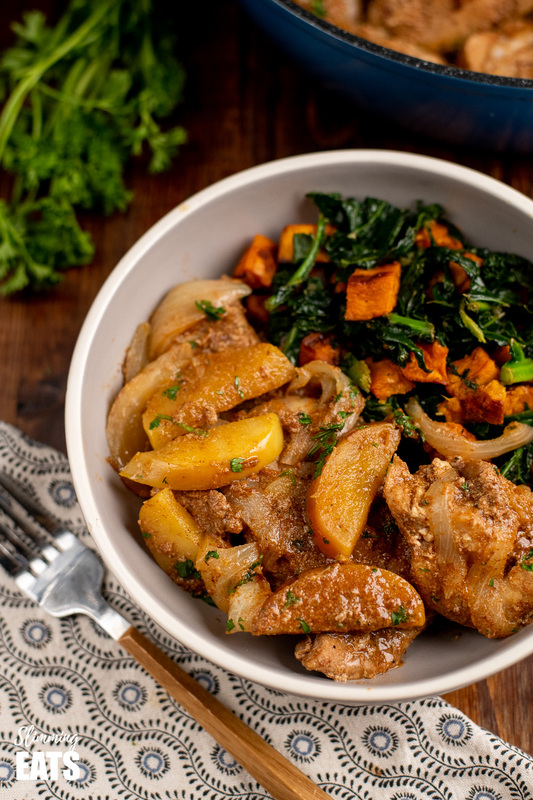 Using a similar method of cooking as my Stove Top BBQ Pork, I figured a Stove Top Pork with Apples dish would be just perfect. One Pan, not much mess and super quick to make dish is always going to be a bonus. 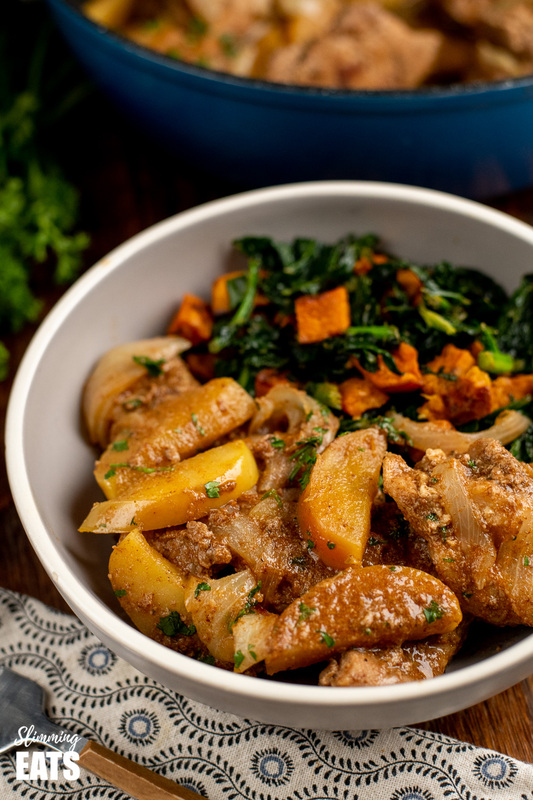 I already had some sweet potato cubes roasting in the oven and a big bag of chopped Kale in the fridge, so knew these would pair perfectly with the finished dish. This is something I do quite often when coming up with meals. Rather than think what Speed foods can I serve with this tonight. I tend to decide on my speed foods first, that way they are pretty much always incorporated into the meal. You can read more about this little tip on my Speed Foods before Free Foods post. 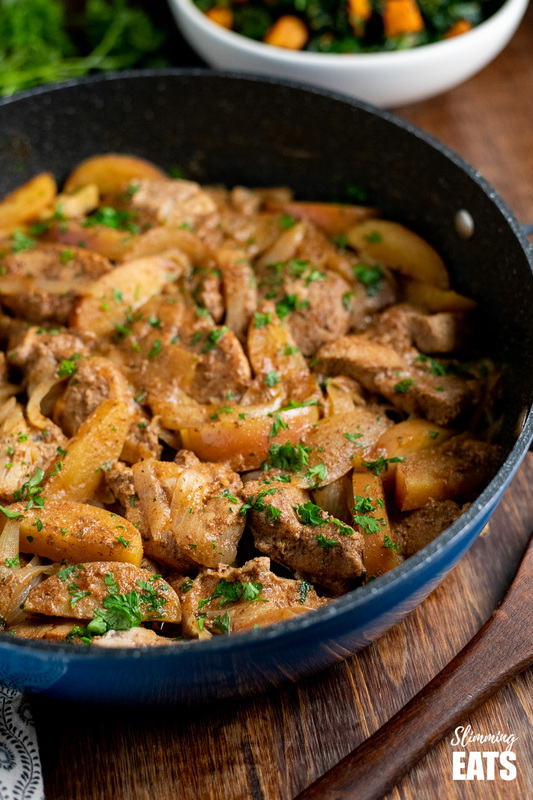 When cutting up the pork shoulder for this Stove Top Pork with Apples, keep the pieces quite big, don’t slice them too small. The bigger the pieces it will keep nice and tender for this style of cooking it. Just a handful of ingredients most of us have in a store cupboard, this really is such an easy to put together dish, that will be on the table super quick. or head on over to my FULL RECIPE INDEX with over 850+ delicious Slimming World Recipes, all fully searchable by meal type, ingredients and syn values etc. 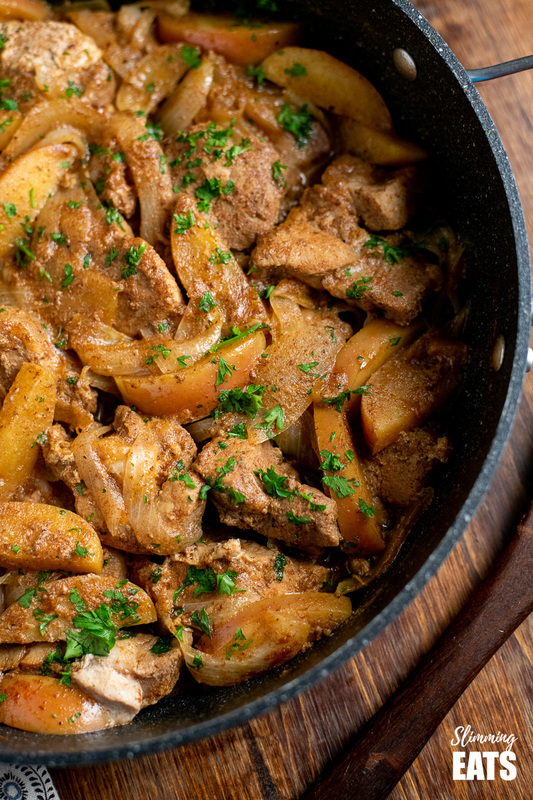 What speed foods can I serve with this Stove Top Pork with Apples? As mentioned above I went for some Kale, which I just sauteed in a pan with some garlic and cooking oil spray and then added a little stock to braise. Once it was done I stirred through some roasted sweet potato, but you could change that for some roasted butternut squash for some additional speed foods. Finish off with a pinch of black pepper. Syn Free Sauteed garlic Shredded Brussel Sprouts would go really well with this dish also. 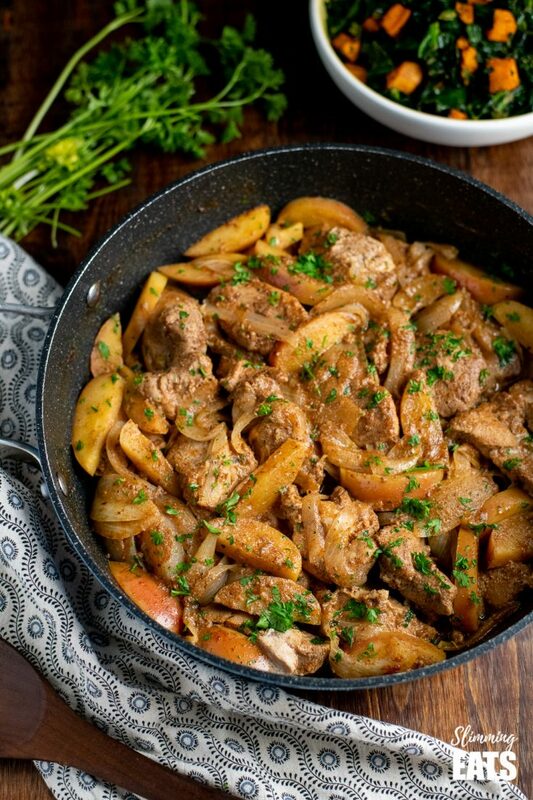 Stove Top Pork and Apples - this delicious flavoursome dish of tender pork with sweet apples, is all cooked on the stove top for a perfect meal for the whole family. Add the pork, apple, onion and garlic to a large deep frying pan. Place on a high heat and bring to a boil, as it starts to bubble reduce heat to medium and allow it to continue to simmer (bubble) (no lid) for approx 25-30 mins. The sauce will reduce down and thicken and the meat goes lovely and tender. If the sauce looks like it is reducing too much just add a little more drop of water. Pork is cooked when there is just a small amount of liquid coating the pork and apples like a glaze. This recipe is Gluten Free, Dairy Free, Paleo, Whole30, Slimming World and Weight Watchers friendly. Made this last night. Really quick to make and tasted lovely!